Rubber synchronous driving belt: This is a special kind of rubber driving belt to transmit the mechanical driving force. 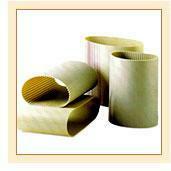 Circular arc tooth belt: Used in sewing machinery, food processing equipment and small household electrical appliances. Composed of closed round rubber, teeth and attached belt or pulley. Various precision machine tools and instruments.